You're a mom - you have to do a lot of things at the same time, and at the same time, look after the baby, and with all this, you're definitely looking for a dress that will make you comfortable, but will make you look dazzling. The Flamingo breastfeeding dress from our collection meets all these conditions. Flamingo breastfeeding dress is our proposal for nursing moms, but also those who are just waiting for their baby to come to the world. The loose shape and the right length make the dress perfect for pregnancy as a comfortable tunic. What's more, thanks to its high quality fabric and versatile styling, this dress can be worn long after you finish breastfeeding. Our clothes are designed so that they are always on time and provide mothers with comfort while breastfeeding, as well as comfort during daily walks with the baby. The dress has two side pockets for storing things such as keys and phone. At the neckline there are two zippers, which are a decoration, but also allow discreet exposure of the breast to feed. The flamingos are printed on fabric. 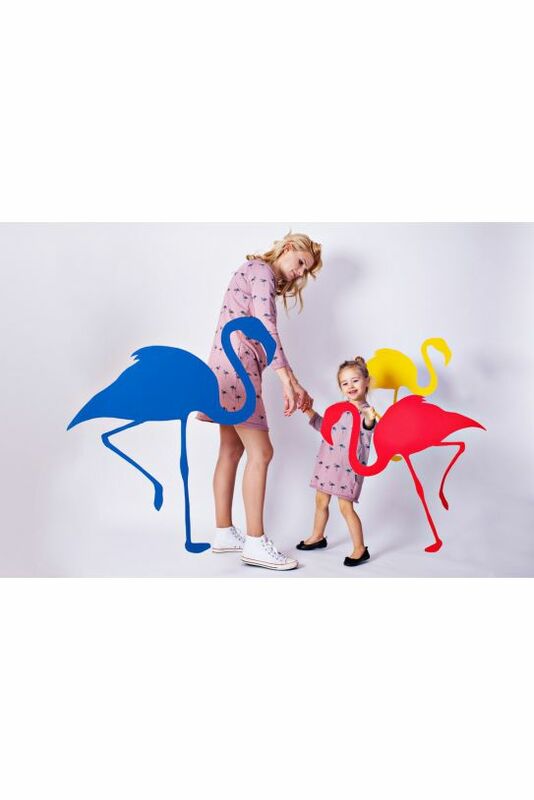 We also recommend a collection of children's clothing with flamingo motives. high quality - made of high quality cotton fabric with elastane.